DC Comics is pushing its New 52 five years into the future, with Jeff Lemire, Keith Giffen, Brian Azzarello and Dan Jurgens writing a new, weekly series called The New 52: Futures End, the publisher confirmed today. The Associated Press says the story will showcase how heroes deal with the passage of time and technology. The series debuts on Free Comic Book Day in May with a free zero issue drawn by Ethan Van Sciver, and the first issue of the weekly series will be available later that month. The book will run at the same time as Batman: Eternal, meaning that for the duration fo those stories DC will be publishing two weekly series. "Just look at the talent roster that's been gathered. How could you not want to be a part of that?" asked Giffen (who did layouts for DC's weekly comic series 52 in 2006 and part of 2007's Countdown to Final Crisis) in an interview with AP. Giffen has already worked with Jurgens a fair bit in the New 52, co-writing Superman and writing Green Arrow briefly while Jurgens drew. Prior to the New 52 relaunch, the pair collaborated on some Booster Gold stories. Both have been staples of DC's creative lineup over the last thirty years, but until the very recent past they had rarely worked together. "Really, what we're trying to do with this book is to explore the nature of what a hero is and we're doing that, obviously by playing with the future of the New 52 timeline," Lemire said. "Past present and future all colliding in this story line." He noted that the past, in this instance, will be represented by Frankenstein, the present with Firestorm and the future with Batman Beyond, who will be making his first canonical appearance in the DC Universe. 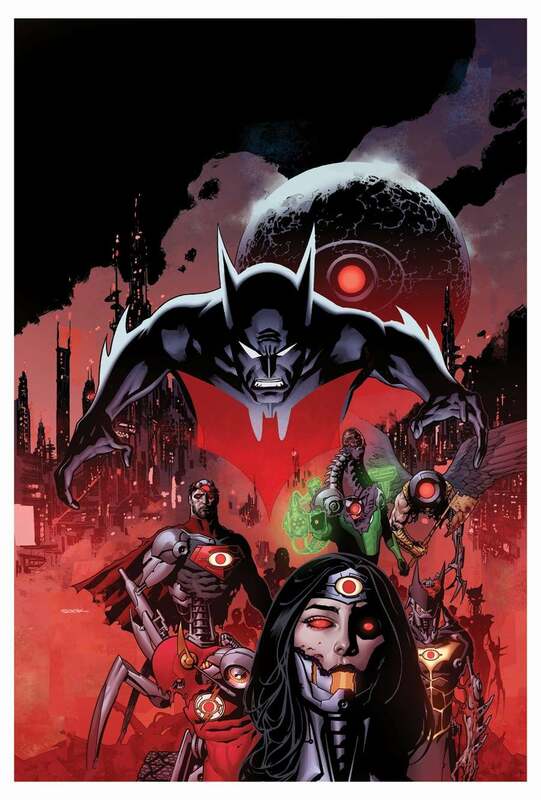 The Brother Eye satellite from O.M.A.C., which figured prominently in the pre-relaunch Infinite Crisis crossover, also appears on the cover to the Free Comic Book Day issue. Lemire had a short-lived but critically-acclaimed run on Frankenstein: Agent of S.H.A.D.E. at the start of the New 52, while Jurgens helmed the final arc of The Fury of Firestorm the Nuclear Man in the New 52 after it launched under Van Sciver and co-writer Gail Simone. Artists on the series include Van Sciver along with Jesus Merino, Aaron Lopresti and Jurgens, plus others yet to be announced. Ryan Sook will provide covers.